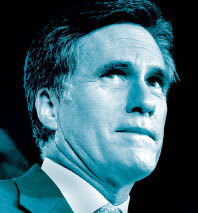 Mitt Romney has a funny idea of how to solve the subprime crisis: Get the rich to pay for it. At a fund-raiser at the New York Athletic Club last week, hedge-fund heavies and other wealthy Republicans—including developer Steve Ross, former congressman (and onetime Hillary opponent) Rick Lazio, hedge-funder Julian Robertson, eBay CEO Meg Whitman, and real-estate mogul Louis Dubin, who’s Alfred Taubman’s son-in-law—paid a minimum of $1,000 a head ($2,300 if they wanted a commemorative photo) to hear the former Massachusetts governor spell out his presidential vision. During the question-and-answer session, David Koch—the richest New Yorker, according to Forbes—raised his hand and asked what Romney would do about the country’s subprime-mortgage crisis. “Well, if you could write a check,” quipped Romney. The billionaire laughed.